In the video work of Monika Tichacek conventional cinematic narrative is disrupted by a keen sense of surrealistic grotesquery. Romance  featured a woman in a faux-hospital gown lying on a white bed in a set that suggested an operating theatre or a futuristic salon. With her face pinned by hooks through eyebrows and lips, a close up of the performer’s barely moving face is relayed to a video monitor. The scene is eerie and, while the narrative is ambiguous, the viewer feels as though they are looking into a complete and self-contained world. Tichacek has explored similarly elaborate mis en scene, ramping up the oddity without abandoning a reflexive sense of humour. In Lineage of The Divine  Tichacek explores a more complex narrative of mirror imagery, doubles and reflected desires, finding form for these ideas in bodies altered by cosmetic surgery and extended by medical prosthetics. While the bodies of the two women in the video – one old, the other young, one altered, one contained – propose reflections, desire finds from in the unlikely literal rendering of the phrase “to pull heart strings” as a hand reaches inside a body and pulls strings. The story comes to a close with a song and dance number. Tichacek’s most ambitious work to date is The Shadowers , a slowly unfolding narrative that finds three women locked in a sado-masochistic courtship that plays out through a series of pursuits and seductions. With the action set in bush land - and in what appears to be the dark, fetid root system of a tree - the atmosphere of The Shadowers is intense and compelling. The themes of The Shadowers are those that the artist has explored throughout her work; transformations, apparitions and the suggestion of a parallel spirit world ready to erupt. 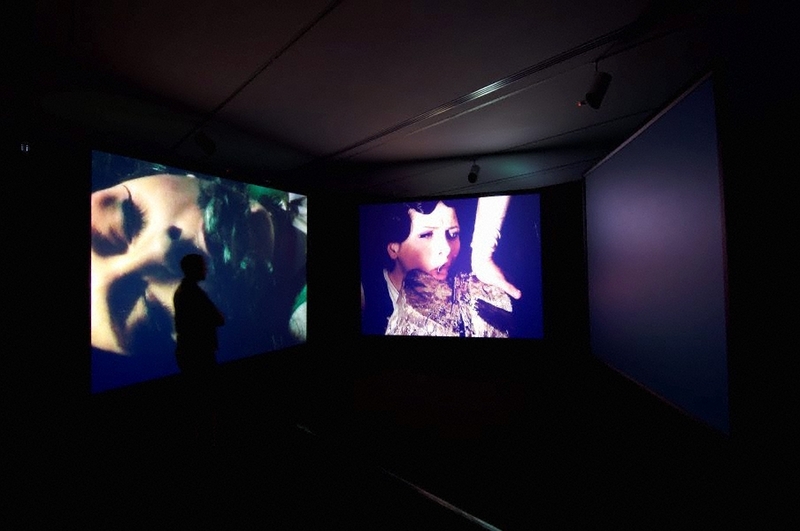 Selected solo exhibitions: The Shadowers, Herzliya Museum, Tel Aviv, Israel, 2006, Sherman Galleries, Sydney, Artspace, Sydney, Karen Woodbury Gallery, Melbourne, 2005. Selected group exhibitions: Anne Landa Award (winner), Art Gallery of New South Wales, Sydney, 2006. Project III, Contemporary Art Centre of South Australia, Adelaide, 2005. Festivus 04, Sherman Galleries, Sydney, Supernatural Artificial: Contemporary Photo-based Art from Australia, Metropolitan Museum of Photography, Tokyo, Japan, I thought I knew but I was wrong: New Australian Video Art, Australian Centre for the Moving Image and Asialink touring exhibition, Bangkok, Beijing, Singapore and Seoul, 2004. Selected publications: New Deities: Art and the cult of celebrity, Artlink, September 2007. Shock of baroque, The Australian, 17 November 2006, Moving images: Anne Landa Award for video and new media arts, Look, November 2006, Twenty: Sherman Galleries 1986–2006, Thames and Hudson, Melbourne, 2006, Monika Tichacek: Use me, Broadsheet, June–August 2005.